In 1928, Sunbeam designed two prototype passenger chassis, a three-axle sixty-seven seat double-decker bus and a two-axle single-decker bus or coach. Two model names, ‘Sikh’ and ‘Pathan’, were adopted for them. They both had Sunbeam engines, but, despite their quality and reliability, very few were produced. Here is a rare example of a Sikh, however, dating to 1933. It had a very handsome 64-seat body by that doomed London bodybuilder, Christopher Dodson, doomed because it concentrated business almost solely on London independents, due to disappear from 1933, when London Transport took them all over. You will notice the bizarre open cab with storm apron and protective cowling, insisted upon by Westminster’s managing director, who felt that enclosed cabs were unhealthy! 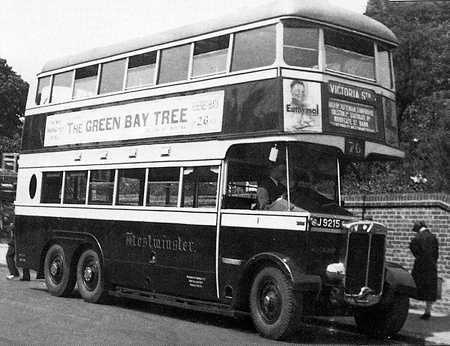 The Westminster Omnibus Co. was taken over by LPTB in 1934, but the bus was barely operated by LPTB, as SM1, before being withdrawn from service. In 1931, a Sikh chassis was modified as a trolleybus, which was an immediate success, creating a whole new passenger market which the bus chassis never penetrated. 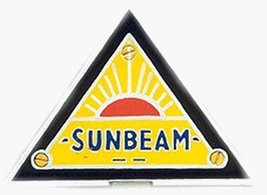 To the right is the cheery radiator badge which Sunbeam used on their vehicles, which would have looked nice on the Sikh’s chrome one. Dodson did, though build for operators outside London, albeit in small numbers. Wolverhampton`s Guys come to mind. Me again. I really enjoyed this post about Sunbeam. Was the open cab not something to do with London Police regulations at the time, where glass screens were deemed dangerous? Not sure, just asking! The LGOC had fought and won the windscreen battle in about 1931. It produced its prototype, it with a windscreen, but with an outside staircase, and ran it about a bit with a windscreen, the first. There was not fuss;maybe the notoriously conservative Metropolitan Police Commissioners didn’t notice! It then produced the first 49 production ones and the MPC DID notice, banning further production with windscreens, but not insisting that those already produced be converted. After about 12-18 months, the MPC, presumably being convinced that they weren’t a safety hazard, relented and windscreens were fitted retrospectively to later ones, which, after the first 150, then sported inside staircases, but were not objected to! Even in the mid-30’s the MPC stopped a production run of Central Area (red) single-deck Q’s with open front entrances in front of the front wheels, after an initial run of them was on the road! There was worry about passengers falling out and going under the wheels. I’m not sure that this was ever a problem, although it was resolved years later with knifejack doors. You are right, John, that Dodson did work other than for London ‘Independents’ (I actually feel that that were more against ‘The Combine’ the LGOC/Underground Group and therefore supported the ‘little feller’!). You mention work they did for Wolverhampton Corporation Guys, but, by coincidence, only today did I discover that Dodson bodied some thirty-odd AEC Regents delivered to Brighton, Hove & District in 1935. They were part of Thos. Tilling group, which, with its London roots, would have been well aware of Dodson’s existence. I’d love to see a photo of these buses to see the design of bodywork. Must start ferreting! London Transport inherited quite a few buses with cab (half) doors and left them in situ, Chris. I think the lack of doors in their own designs was more a case of being able to store buses in their garages closer to each other without doors. When RT1 came along, they’d got around the problem by having a sliding door inside of the bodywork line. With it, deservedly, came more comfort for drivers. STL’s did have concertina-type blinds to fill the entry gap, but they could only be used to protect the empty cab from the worst elements; you couldn’t drive with one down as it impaired vision. You’d have needed to be observant, and lucky, to ever see one down, though! Chris. It would be great to see a picture of the Brighton Tilling Regents with Dodson body. Dodson built some of the ST bodies for Tilling to Tilling design, I believe, but not the STL batch as far as I know. Dodson would make an interesting article in its own right if it could be researched. Small numbers of bodies were built for several municipalities as well as Wolverhampton, including Derby, Leeds. Another article would be the Pirates in London, with complete fleet lists. Dodson were by no means the only builders here, as Birch, Strachan and Brown etc. were also involved. Must get down to some homework! Meanwhile, I will do some digging to see if I can trace photos of any of the BH&D Dodson-bodies AEC Regents. Chris. The complete registration for Westminster Sunbeam Sikh (H36/28R) in photo (taken at Edmonton) is JJ 9215. It was licensed to run on London Routes 76 & 73, entering service FEB 1933 as the largest running London bus at the time. It was the last bus design by Dodson Ltd. before exiting the business in April, 1933. The Dodson family originally made horse buses from the mid 1800’s until motorized buses came about after 1900. I’m related to the family and researching the business so I really enjoy finding posts and photographs like this! I’m sure it’s true what they say – history begins on your birthday. I’m a child of the fifties and although I stretch it to post-war forties, it really all starts for me in 1952 with two of my favourite batches of buses, the STD PD2s and Regent IIIs, delivered in 1952. I then began to back track – through the excellent British Buses since 1900 and John Aldridge. Sunbeam attracted my attention because they were MOTORbuses and John Aldridge implies that the quality of build was so high that they were too good and therefore too expensive for the general market. Likewise with Dodson bodies. No PSV historian is ignorant of the name, but few of us will have had first hand experience of their products. When some of us are in our wheelchairs going misty eyed about AEC, Leyland, Roe, Weymann – or whoever – what will that mean to our grandsons and granddaughters? Food for thought – or is just too depressing? How wonderful that a modern Dodson is researching the business!. I do hope the findings become available, as I have recently come across several instances of Dodson bodywork outside London. Many more mid 1920s on Dennis 4 ton and Leyland G series type vehicles. Leeds Corporation. There must be many more out there…feel like searching and telling everyone? I’d say, Phil, that we are as delighted to find a member of the Dodson family as you are to find the posting. Maybe you could post a potted history of this well-regarded company, with a couple of photos, for us all to enjoy. If the above photo was the last Dodson design, the company went out on a real high – it is very attractive. Did the company come to a complete halt in 1933, or did it have other irons in the fire which kept it going? [Thx for the full registration – now updated]. Just thought of 2 more Dodson customers. There has to be many more. On the Dodson theme, Portsmouth Corporation started it’s motorbus fleet with 10 Thornycroft J’s in 1919, which had locally built Wadham bodies. But in 1926/27, these were rebodied by the Corporation, using ex-LGOC B-type bodies, built by Dodson. They also bought a complete B-type, with a Dodson body (this did not last long). On withdrawal by c.1929/30, one of the Thornycrofts (No.10, BK 2977) with it’s Dodson body was preserved, and is fortunately still with us. It is located at the Milestones Museum in Basingstoke, and looks extremely attractive in a contemporary setting of a street scene with other Thornycroft commercial vehicles of that era. Re the Dodson theme, the preserved Portsmouth Thronycroft J at Basingstoke is registered BK 2986 (not BK 2977). Apologies for error in my memory of the batch, which was 1-10 (BK 2977-BK 2986). Chris. Christopher Dodson retired and closed up the business in 1933 due to LPTB Act which took away his "Independent" bus operator customers. The LGOC had hindered bus competition and his business for years which is why he was so devoted to supporting the needs of independent operators and against "The Combine" group as you mentioned. Dodson Ltd. also built trolleybus bodies from 1912-1933, mainly for Keighley, Wolverhampton and Derby. Christopher’s brothers also started a bus service on the Isle of Wight in 1921, Dodson & Campbell Ltd, which became Dodson Bros Ltd/Vectis Bus Co. in 1923. Christopher was also a director in that company which merged with Southern Railway in 1929 to become Southern Vectis. All their buses had Dodson built bodies of course up until 1932 when they retired and sold their interest in the company. John interestingly mentioned that Hastings Tramways was a Dodson customer. Dodson built 8 trolleybuses for Hastings in 1928, one of which,(DY 4965), still survives today. Restored and known as "Happy Harold" it has been fitted with a diesel engine to run as a bus. There is a short 1928 film clip of when the 8 Hastings trolleybuses were put into service that can be watched at this You Tube link. "Happy Harold" is the trolleybus observed on right side from :18 to :43 seconds into the film clip. Thanks Phil for the Utube film!!! How about that!!! Fascinating thread. I wonder if anyone has information regarding the Westminster livery carried on the Sunbeam Sikh? Was it red/cream? Maybe, if Phil Dodson sees this, he could tell us. Looking at this vehicle again, it’s got to be one of my favourite buses ever. What a shame that Dodson packed up and never built any more of them. Could someone with DVLA access give the subsequent history of the vehicle? Didn’t it pass to Derby Corporation for a short time, or was that another one? The PSVC lists JJ 9215 as withdrawn by London Transport in 1934; to G J Dawson, SW9 (dealer) 5/35; Wigan & District Subsistence Production Society, Wigan, 1/37; G Pudifer, Liverpool, 9/39; J Routledge, Seaforth, Liverpool (dealer) 11/39, and scrapped. According to Blacker, Lunn, & Westgate (London’s Buses Volume One – The Independent Era 1922-1934) Westminster’s livery was red and cream. The absence of a windscreen was apparently a peculiarity of one of the managing director, Mr Rich, who thought that windscreens were unsafe and that the draughts they created were bad for drivers’ health. JJ 9215 was reported to be a smooth runner but had a tendency to boil quickly. There was a second Sikh built in 1931 with an older style of Dodson body for the Sphere Omnibus Co, but it did not enter service with them, although it was successfully submitted to the Police for testing. It became UK 7456 and was demonstrated by Sunbeam to Mansfield District, Midland General, and Derby, Birmingham, and Northampton Corporations, and was scrapped in 1940. Presumably this is the vehicle to which John refers. Thanks muchly, Michael, for answering the queries Colin, John and I raised and even more! So sad, the number of manufacturers (vis Gilford and Dodson) who failed through no fault of their own, but rather because their customer base simple dried up or disappeared. What price a Euro 5 Gilford with Dodson body? Yes Michael, many thanks for the info on the 2 Sikhs. There is something truly magnificent about the "big buses" of this era, and I am reminded of that marvellous machine introduced by Wolverhampton Corporation in (1929?). Again, with a Dodson body, but a 6 wheeled petrol electric Tilling Stevens. I only have a photo in a book; otherwise I would post it ! The Westminster Omnibus Co. Sunbeam Sikh SM1 was withdrawn by the LPTB on 10 July 1934. This site gives a wealth of detail about the bus models of the Sunbeam company:- www.historywebsite.co.uk/Museum In all its product ranges, bicycles, motorcycles, cars and buses, the Sunbeam company was synonymous with exceptionally high quality in keeping with the principles of the founder, John Marston, and almost all components were produced in house. This was reflected in the retail prices, and, in the depressed markets of the inter war years, sales were limited. The various parts of the Sunbeam group fell into different hands, though the name lived on for some models of motorcycle, motor scooter, car, and, of course, trolleybus. At least the trolley manufacture, ultimately part of Guy, remained in Wolverhampton to the end. Re John W/Michael W’s post on 29/8/12, I’ve found other, slightly conflicting info on the Derby Corporation Sikh. No. 44 was an ex-Sunbeam demonstrator, registration UK 7456 (chassis K10123) which dated from 1929. Its Dodson body seating was a smaller H35/32R, presumably to an earlier style, since the Westminster one was larger and the 1933 style. It went into service with Derby in 1933 and was also withdrawn in 1939. I am now following Thornycroft. Have you seen the magnificent 6 wheeler photo on the Thornycroft site, with a camel roof body, which is a bit "Hall Lewis" looking. Also, trying to unearth photos of the 4 wheel BC Boadicea model as supplied to Southampton etc. This explosion of competition from 1929 to 1932 provides enough material for someone to write a book. It would need someone a lot more technical than me though, a mere ageing enthusiast! The engine of the Sikh was an advanced and powerful overhead valve unit of 7.98 litres, developing 142 bhp at 2,400 rpm., which drove via a friction clutch into a four speed gearbox. The same engine was fitted to the more successful Pathan single deck model. Such a powerful engine must have given the Sikh and the Pathan remarkable road performances by any standard, certainly well above the norm for the early 1930s, though probably at a cost in fuel consumption. The Westminster Sikh weighed 7 tons 5cwt 3qtr, which seems remarkably light, and entered service in London in the week commencing 20th February 1933; the absence of a windscreen was entirely due to the rigid opinions of the Westminster company’s managing director, as the Met Police had capitulated on cab windscreens by this time. Only three Sikhs were made, the Westminster one being the second in production. In view of the imminent introduction of the London Passenger Transport Act on 1st July 1933, it is surprising that Westminster should have purchased such an expensive piece of capital equipment at so late a date. Almost inevitably, the solitary Sikh SM 1 did not survive long in the standardised world of the LPTB, being withdrawn in 1934 and disposed of on 16 May 1935. Its subsequent fate is unclear. As Michael Wadman and Chris Hebbron state above, the very first Sikh was cleared by the Met Police for use by the Sphere Omnibus Company on routes 73 and 76, but it never entered service, becoming instead a Sunbeam demonstrator and vanishing in the early years of WW2. The third Sikh was converted to a trolleybus, and opened up a much more successful market, though the original Sunbeam Company was not to see much of the benefit. In 1934, STD (for Sunbeam Talbot Darracq as then was) went into receivership, and the Rootes group picked up most of the assets. John, the best source of information on Thornycroft is the volume published in 2001 in the Ian Allen Transport Library (ISBN 0 7110 28141) written by the ever dependable Alan Townsin, who once worked for the firm himself. Details and photos of the bus models are there aplenty. Unfortunately, the book has no photos of a Southampton BC Forward, but there is a picture of Southampton’s rare HC six wheeler and another of a Daring. A picture of a United BC Forward may be found on this site under ‘Best Bits – A United Line Up’. Thanks Roger. Will look up the Thornycroft book, especially with the HC 6 wheeler being there! I remember them having English Electric bodies very similar to the Pompey Karriers. Please Note if you want to send a photograph with your comment please use the Contact Page by clicking here or send as an attachment via email. If no or an incorrect code is entered you will get the CAPTCHA ERROR PAGE, right click anywhere on the page and click on Back so you can enter or correct the code without losing your comment.